Crashed into defender on loan from Arsenal after late winner against Accrington. 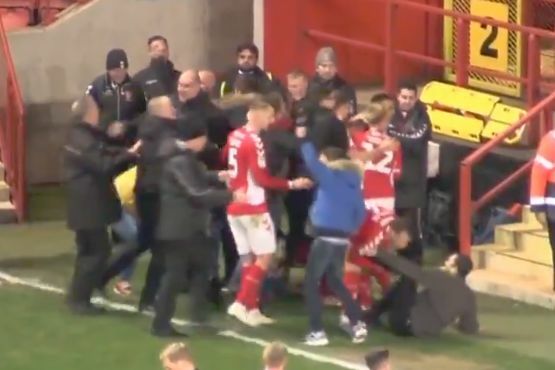 A Charlton fan slipped and slid into defender Krystian Bielik, currently on loan to the club from Arsenal, as supporters spilled onto the pitch following an added-time winner against Accrington Stanley on Saturday. A bad-tempered League One clash at The Valley was eventually decided by a single goal – a 93rd-minute penalty strike that sparked joyous scenes among the home crowd. Several people managed to get onto the pitch and join the celebrating players following Karlan Grant’s goal. One late arrival slipped as he approached the group and crashed feet first into 21-year-old Polish centre-back Bielik, who fell to the floor clutching an injury. The 1-0 result at the final whistle followed a mass brawl in the second-half which served to heighten emotions in the crowd. Charlton’s Lyle Taylor and Accrington Stanley goalkeeper Jonny Maxted were both shown red cards for their involvement in the 82nd minute.